If Indiana isn’t famous for good old porch sitting, I don’t know what it’s famous for. Warm, breezy summers, crisp fall evenings with fresh air flowing through the patio and beautiful spring days with the chirping of birds and buzzing of bees are all the best times for enjoying a meal with a view. 50-cent throwback days aren’t the only draw to this classic favorite. 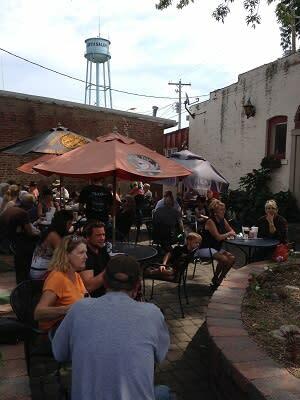 The patio sits front and center in bustling downtown Plainfield. Sip a shake in the sun, devour a pie in the fall or warm up with coffee in the winter. Burgers, sandwiches and other diner favorites all can be enjoyed inside or out. 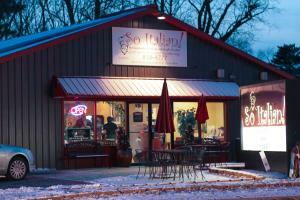 Step out to the brick patio area and enjoy the open air pizzeria restaurant, nestled right in downtown North Salem. Authentic Italian cuisine -- pasta, calzones and pizza -- with a large selection of wine and beer will please your tastebuds. In addition to whole pizzas, pizza by the slice is available. This establishment is closed on Tuesdays and only accepts cash. Front porch sitting at this home-turned-cafe is a popular pastime in Danville. Soups made from scratch using locally grown ingredients, delicious sandwiches atop fresh baked bread and flavorful salads are all on the menu. This upscale lunch and dinner location offers elegant food in a casual atmosphere. The plentiful menu offerings extend to a full children&apos;s menu as well. The patio seating is covered and comfortable with a panoramic view of The Shops at Perry Crossing mall. Umbrellas decorate the patio at Opa and this Greek food destination has all the traditional Mediterranean menu items. Whether dining with family, friends or on a date, Opa provides a fun and delicious must-eat. The pergola-covered patio creates the perfect atmosphere for any occasion from a family dinner to cocktails. The menu features sandwiches, barbecue ribs, wood-fired pizzas, steaks and pastas, plus a good kid&apos;s menu. Appetizers, wings, grilled food, pizza and beer are staples on the menu at B Squared. The patio offers a fun gathering space for the after-work and weekend crowd. Expect weekly open mic and karaoke events. This hometown favorite is known for its prime rib and nightly specials, but has something on the menu for everyone. 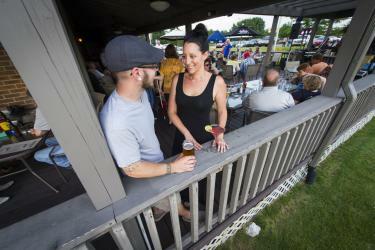 Its patio becomes especially popular on summer weekends with live music added to the mix. The perfect combination of food and patio space for anyone to unwind can be found right next to all the hotels at the I-70 Plainfield exit. Beer drinkers should especially love this place with 16 taps including at least six of Black Swan&apos;s own creations. With great food, plenty of craft beer and an outdoor patio, this is a perfect choice to enjoy lunch or an evening out. Little red umbrellas dot the cafe tables on the green patio in front of So Italian! This fun restaurant offers pizza, pasta, sandwiches, salads and even gluten-free options.